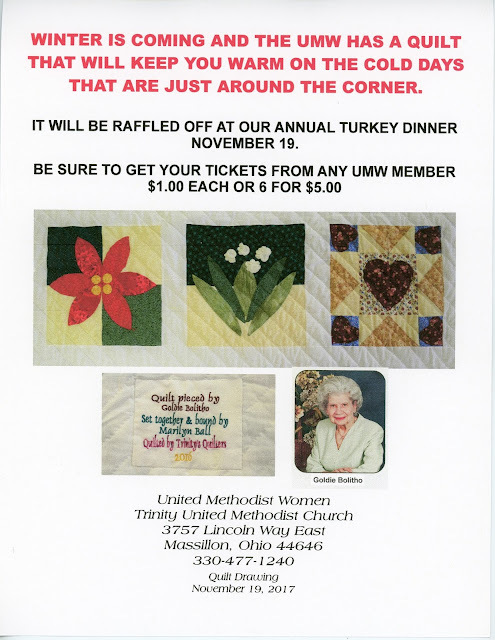 Every year the Trinity United Methodist Women raffle off a a quilt to raise money for the many mission project that they support. All this work is never for them. I've never seen them buy anything for themselves except the occasional coffee or doughnut, and I'm pretty sure that those are all donated too. But saying "Annual Quilt Raffle" sound ordinary. This year is no exception. Our friend, and longtime Trinity member, Goldie Bolitho recently stopped quilting, sewing, knitting, crocheting, and all the other "fiber arts" things that she loves for decades because her eyesight has made it impossible to continue. But Goldie wanted her work to be a blessing to someone else and so she donated her supplies (literally more than two truckloads of stuff) to Trinity's crafters and to our sewing and crafting friends at The Joy Center in Big Creek, Kentucky. Among those things was almost an entire quilt, all of the quilt squares that were needed for one, and thus most of the hard, tedious, and incredibly artistic detail work. And they were truly beautiful works of art. They were so impressive, that Marilyn Ball put them all together into a finished quilt top, and all of our quilters (who meet here every Thursday morning - and you're invited to join them, hint, hint) pitched in to make a bottom, add the soft batting in the middle, and actually do the quilting that puts everything together. And so what we end up with is yet another one-of-a-kind art project that will also do a great job of keeping you warm at night. Hundreds of hours and untold amounts of love and passion poured into one beautiful quilt that you can use to keep warm in your bed or while you watch television on the sofa this winter. And you can have a chance to make this beauty your own for only $1 per ticket or 6 for $5.